S Carcelén García, D Alameda García, T Pintado Blanco (2017): “Practices, skills and trends in digital advertising. The perspective of Spanish advertisers”. Revista Latina de Comunicación Social, 72, pp. 1.648 to 1.669. Introduction: This article presents the results of a study on the current and future use of different online communication techniques by Spanish advertisers, as well as their perception of the level of digital competence of professionals working in the advertising sector. Methods: The study is based on an online survey applied to a national sample of 301 advertising and marketing directors working for a variety of Spanish companies in terms of size, geographical scope and sector of activity. Results and conclusions: Companies are expected to gradually increase their budget for digital marketing and, thus, the advertising sector is expected to experience greater professionalisation and greater demand for experts in new technologies and digital communication. At present, advertisers are developing communication strategies that are based on traditional and easy-to-implement online communication techniques, leaving aside the more sophisticated techniques whose implementation requires more qualified and specialised professionals. In this sense, there is a lack of training in digital skills in the sector. Information and communication technology (ICT); digital communication; education; digital skills; advertisers; trends. 1. Introduction. 2. Methods. 2.1. Methodological strategies. 2.2. Population and sample. 2.3. Data collection tools. 2.4. Procedure. 3. Results. 3.1. Current use of digital communication techniques in Spanish Companies. 3.2. Experience and education in digital skills among advertising professionals. 3.3. Future trends in online communication in Spanish companies. 4. Discussion and conclusions. 5. References. The spectacular development experienced in recent years by the information and communication technologies (ICT) has prompted the emergence of numerous techniques in the realm of digital communication. In addition, consumers have increasingly ceased to be simple receivers of information and have become co-creators in brands’ communication and content production processes, and are losing confidence in conventional advertising, to the benefit of formats that empower the opinion of other users and rely on dissemination across new social media (Nielsen Global Trust in Advertising Survey, 2015). Therefore, the context of communication has changed significantly, which has forced companies to include in their marketing and communication strategies actions that are based on new technologies and are focused on the online environment. In this context, digital marketing is understood as the process of using the technology to integrate, segment and measure communication actions with the purpose of retaining and getting customers (Hamill et al., 2010). Investment in digital marketing in the United States continues the trend of previous years, since last year it continued growing above conventional advertising: 9.9% vs. -1.3%, respectively (The CMO Survey, 2016). In addition, in 2016 companies allocated 30% of their budget to digital marketing, and this percentage is expected to increase up to 35% in 2019 (Digital Marketing Forecasts: 2014 to 2019, 2014). In the case of Spain, 6% of the investment in marketing is digital, which represents a growth of 175% since 2010 (according to the AMES 2016 study, from 2010 to date, digital communication has grown 146%, mobile marketing 217% and internet advertising 56%). In addition, digital investment in 2016 increased 21.5% compared to the previous year, which represents a 29% share compared to the total investment in conventional media (occupying the second place, after television) (IAB, 2017). If we focus on the case of the Spanish market, according to the index of digital competence that determines the level of implementation of digital competencies in companies, only 16% of companies are ready to deal successfully with the digital transformation (2º Estudio de Competencias Digitales en la Empresa Española, 2016). In addition, according to the same study, training is still a need for companies, as only 22% provide digital training on a regular basis, and although approximately 50% of companies are aware of most digital functions, only 32% of them implement all of these functions (only a third hires a specialist in this matter). Moreover, this digital transformation not only provokes the emergence of new digital profiles but also modifies the competencies required by companies, and makes companies to look for candidates with new digital skills. All this generates a gap between what companies demand in digital skills and the preparation and training of the current and future professionals who access the labour market. Therefore, there is a need to characterise the current panorama of Spanish companies in the new digital context, as well as the perception of marketing and communication directors on the present and future of the advertising industry and its professionals. This study will allow us to formulate guidelines for universities and education centres on the present and future of the advertising market and its demands so that they can prepare students properly. In this sense, the White Paper of Communication Degrees produced by the National Quality Assessment and Accreditation Agency of Spain (ANECA, 2010) gives high scores to all disciplinary knowledge and professional capabilities related to the fields of information and communication technologies and digital communication. In the case of BA degree programmes in Journalism, the “knowledge and application of technologies and systems used to process, develop and transmit information, as well as to express and disseminate contents and fictions” is the sixth disciplinary knowledge in order of importance, with a score of 3.1 (on a 4-point scale). The profile of the Website Manager and Content Editor receives a higher score (3.7). Meanwhile, the professional capacity to “use information and communication technologies and techniques, in the different media or combined and interactive multimedia systems” occupies the ninth place within the most important competences with a score of 3.1 and also getting more consideration in the aforementioned professional profile. In BA degree programmes in Audiovisual Communication, the disciplinary knowledge more related to the new technologies would be the so-called “theoretical-practical knowledge and application of technologies applied to audiovisual media”, which receives a score of 3.08, which makes it the fifth most important within the essential knowledge and with a higher valuation in the professional profile of audio visual production and postproduction designers (3.6). Finally, in BA degree programmes more closely related to the professional activity analysed here (Advertising and Public Relations), the main competence with the highest score in ANECA’s White Paper on Communication Degrees (2010) is the so-called “capacity and ability to use communication technologies and techniques, in the different media or combined and interactive (multimedia) media systems, especially to apply them to the world of communication, with special emphasis on the creation of new platforms”, with an average score of 3.05, and of 3.3 in the case of the professional profile for Creatives and Designers. This is precisely in line with the conclusions reached by the Observatory of Adverting in Spain (AEA, 2016), which points out that advertisers are looking for “platforms that allow them to create value for their brand, innovate and create content, but also those platforms that allow them to tell their messages simultaneously through various media. The consumer journey towards the purchase marks the new strategy of the advertiser in the management of the media, marked by four key factors: the crossmedia presence, the generation of engagement through the creation of contents, the greater knowledge of the consumer with more defined measurement tools and innovation” (p. 61). Holm (2006) also highlights that the integration of traditional communication techniques with the use of new technologies must be further promoted, allowing a greater interaction with the consumer and personalisation of the communications that the company maintains with clients. The digital revolution is enabling the total integration of marketing communication and has made many companies to change their structures to adapt to this new multimedia panorama. From this perspective, commercial communication is redefined and it is understood that new technologies must develop a wholistic view in communication, as explained by Seric and Gil-Saura (2012) when they point out that “Integrated marketing communication is a tactical and strategic business process that is enhanced by advancements in information and communication technology (ICT) and focused on the consumer, and based on customer information obtained from databases conveys a clear and coherent message through the synergies of different communication tools and channels, with the purpose of creating and maintaining the brand value and profitable and long-lasting relationships with customers and stakeholders” (p. 69). Different studies with managers of different companies (Hoffman y Novak, 2011; Deiser & Newton, 2013; Ghotbifar, Marjani & Ramazani, 2017) point out the necessity of companies to integrate in a strategic way traditional marketing and communication with new technologies and different digital tools. These studies also highlight the current difficulty to successfully perform that integration due to the existence of gaps between professionals’ specialised knowledge to meet the demands of companies and carry out the effective combination of offline and online marketing. Other authors point out other aspects that have emerged in the current panorama and that also condition the way companies act: the evolution of the consumer (defined by interaction, engagement, co-creation and hyper connectivity) and the evolution of the media (defined by fragmentation and cross-media strategies) (Day, 2011; Tiago & Veríssimo, 2014; Vernuccio and Ceccotti, 2015). In addition, the collection and management of information generated in the online environment (very dynamic and changing), as well as the management of databases will become the fundamental element in defining effective, efficient and personalised communication programmes according to the audiences and the specific characteristics of the channel itself (Kestnbaum et al., 1998; Preston, 2000; Leeflang et al., 2014; Grishikashvili et al., 2014). Moreover, it should be noted that there is a wide range of education offers in commercial communication in both graduate and postgraduate levels, which should guarantee a highly professionalised future in the sector. However, as mentioned by the Observatory of Advertising in Spain (AEA, 2016, p. 62), it is necessary to determine whether there is capacity to welcome graduates in the advertising sector and above all, to study in depth whether education is adequate, because the rapid transformation and adaptation of the market to the new needs and demands of advertisers does not correspond to large part of the contents currently included in the curricula of most communication degrees (Papí-Gálvez & López-Berna, 2011). In this context, this Observatory of Advertising considers the need for education with sufficient solidity in bachelor’s and master’s degrees, adapted to the new needs of the digital market and the current communication demands of companies. According to Corredor and Farfán (2010), this is a “search for new professional profiles, which provide talent and skills that are new in advertising and that necessarily require different or complementary knowledge with respect to the classic professional profiles, since the changes that the sector experiences in an accelerated way in companies and work processes do not seem to be reflected on the current programmes of study” (p. 109). The new incorporations that are occurring in the commercial communication sector correspond, largely, with new professional profiles associated with digital disciplines. As indicated by Nuñez et al. (2013), the search for experts in digital networks (community managers) and brand content developers (brand entertainment)have been the most wanted professional profiles in recent years, followed by creative programmers and frontend designers with knowledge of internet tools. In the last year, according to the first monograph on selection process in digital competences, the profiles wanted the most by companies were those more linked to digital marketing, including the following 5: Head of Digital Marketing, ECommerce Manager, Chief Digital Officer, SEO Manager and Data Scientist (The Social Media Family, 2017). These are some of the demands from companies to the labour market, despite there are not enough professionals sufficiently prepared to access these positions. Therefore, it becomes necessary to provide a more specialised education to provide more competitive professionals in an ever-changing market. In this regard, it is essential to review and re-design the current education plans to make them more flexible, interdisciplinary and adaptable to the changes in the communication sector. The present study is part of a wider research project titled “New brand communication scenarios in institutions and companies”, which studies brands, consumers and the digital environment, as the three most important aspects for companies in the coming years (The CMO Survey, 2016) and understood as the most important education areas in Communication studies in the future. This quantitative and descriptive study seeks to identify the relationships between companies and consumers in the digital environment and the practices that advertisers are carrying out. This study will identify and contextualise the use of technologies and interactive communication media within the strategies of communication commercial, and the level of development, experience and education of the sector’s professionals. This study can be taken as a basis for analysing the competences and trends in the communication market provoked by the ICT revolution, and the level of adaptation of Spanish companies, in their role of advertisers, in the area of commercial communication. These results will allow us to verify in subsequent works the level of adaptation of the curricula in communication to the trends identified in this study. Measure the practical application of each of the communication tools in the digital environment, and identify any differences across types of businesses and sectors of activity. Evaluate the perception of marketing and communication directors about the digital competences of the people responsible for implementation of the aforementioned techniques. Study the trends in advertising communication among Spanish companies to adapt the education of professionals to the current and future needs of companies. The population under study is made up of marketing and/or advertising managers of Spanish advertisers. Based on this universe of study, the sample is composed of 301 marketing and advertising directors working for the main Spanish brands, representing their diversity in terms of sizes, geographical area of operation, and activity sectors. As mentioned, the selected sample has considered the geographical scope to represent the largest volume of advertisers according to the location of their headquarters. Logically, 22.9% of the consulted advertisers are located in the metropolitan area of Madrid, 15% in the Northeast, Catalonia and Baleares, and 14% in the metropolitan area of Barcelona, as these areas are the most active. The remaining 48.1% of advertisers are located in the rest of the geographical areas. In relation to the size of the company, 45.5% of the consulted advertisers are small businesses (up to 49 employees), 32.6% are medium-sized enterprises (from 50 to 250 employees) and 21.9% are large companies (more than 250 employees). 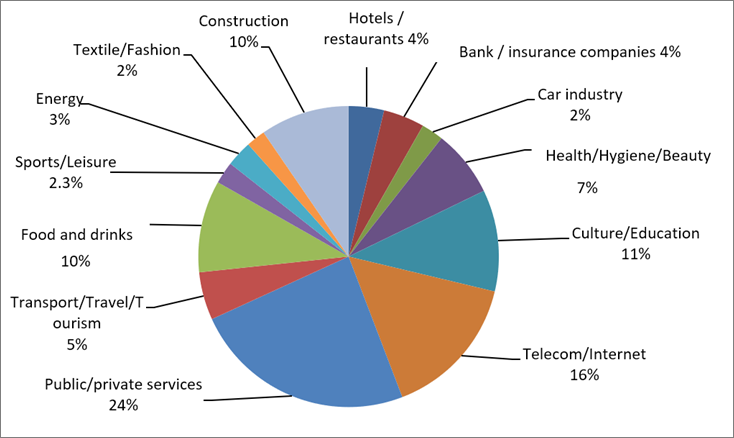 With regards to the sector of activity, Figure 1 shows the distribution of the sample by Sectors, in which two sectors stand out: public and private services (23.3%) and the telecom and internet sector (15%). This quantitative research is based on the online structured interview technique, with a sampling error of +/-5.3% for a confidence level of p=q=0.5. The sampling method was stratified by quotas. With this sample error, we must take the results as indicators of trends in statistical terms. The questionnaire took as reference the most relevant variables obtained in a previous qualitative stage based on three techniques: Delphi interview, focus group and in-depth interviews, whose main objective is to identify the main discursive lines of communication professionals in relation to brand communication, as well as aspects derived from their management, structure, systems, processes, agents as well as the identification of emerging trends in this area. To this end, the sample was composed of opinion leaders from advertising and marketing media, specialists in digital communication, experts from advertising and media agencies and advertising and marketing professionals working for the selected advertisers. This exploratory phase produced the main themes and sub-themes that were included in the online survey questionnaire, which was divided into five fundamental blocks: variables of sample selection and characterisation, attitudes of the marketing and advertising directors towards communication technology, communication actions developed in the communication and marketing strategies, assessment of the effectiveness of each of the communication actions and opinions on Internet-based communication. The scales used in this structured and closed questionnaire made references to nominal variables, Likert scales of five positions and opinion scales. The procedure followed has been the usual for online surveys. The research group designed and validated the questionnaire and then sent an email with a presentation and link to the questionnaire to the directory of directors of the selected advertising companies. This field work was carried out in February and March 2016 and the response rate was 301 questionnaires. Once the questionnaires were filtered and the frequency tables with the basic statistics (frequency, percentage, mean, mode, standard deviation, minimum, maximum and percentiles) were created, we proceeded to carry out analysis of frequencies, tables of contingency, descriptive statistics and factorial analysis with SPSS. An important aspect of this study is the identification of the current application of different digital communication techniques by Spanish companies to characterise the current situation that allows us to guide education institutions in the training of these competences. Figure 2 shows the main communication tools ordered according to their level of application. The tools that stand out are the corporate website (86%), direct marketing with customers via e-mail (77.7%), the development of Facebook accounts (75.7%), Twitter accounts (68.8%) and other social networks (71.4%), online advertising (69.8%), production of YouTube videos (58.5%), Search Engine Optimisation (SEO) and Search Engine Marketing (SEM) (57.8%) and corporate blogs (51.8%). The rest of the communication tools are used for less than half of the sample. At the other end of all the communication possibilities offered by the new technology are tools such as guerrilla marketing, which is used by 29.6% of respondents, augmented reality, by 23.9%; in-game advertising, by only 18.9%; and advergaming, only by 16.6%. As we can see, in general Spanish companies still bet on very conservative and easy-to-implement techniques, leaving aside those more sophisticated tools whose development and application require greater specialised knowledge and preparation, as well as a very specific and costly technology. In addition, the use of these communication tools varies depending on the type of advertiser. The variety of techniques used by a large advertiser, which have larger budget for marketing communications and more needs, is greater than that of smaller companies, which do not need some sophisticated techniques or cannot afford some others due to a lack of budget. To corroborate the above, the following contingency table crosses each of the communication tools with the variable “type of advertiser”. As we can see, larger advertisers (with more than 250 employees) are the ones that, by logic, use more each of the communication formats, while small companies (with up to 49 employees) use less of each of the proposed tools. Exceptions to this general trend are found in some tools such as the corporate use of Facebook, which is more used among small companies than among large-sized advertisers (79.6% versus 65.2%). large-sized advertisers have more communication possibilities while small ones need efficient and effective tools, such as the case of Facebook, which does not require a large budget to develop communication actions. The same applies in the case of medium-sized enterprises (between 50 and 250 employees), which beat larger advertisers in everything related with audiovisual content. Of the medium-sized enterprises, 67.3% create corporate YouTube videos, 62.6% uses corporate blogs, 55.1% used viral video marketing, 59.2% use YouTube cahnnels, and 28.6% use in-game advertising. 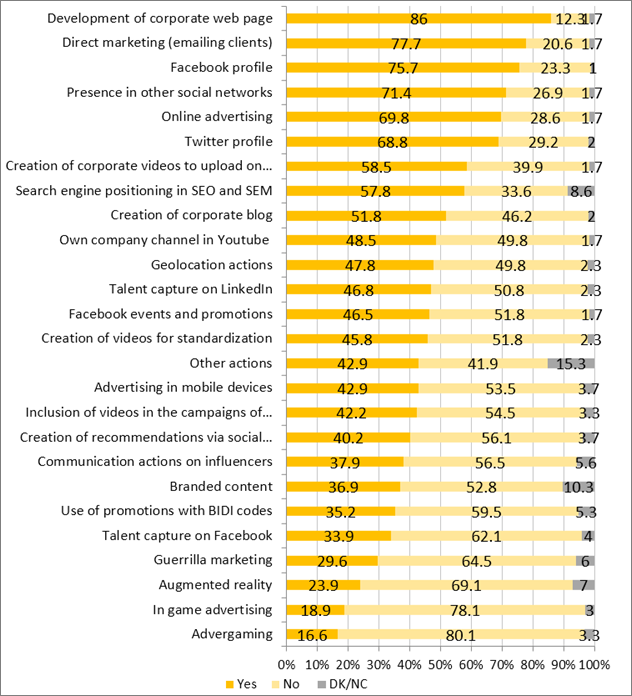 Larger advertisers resort to a wider variety of communication techniques, particularly the most specialised and innovative ones, such as augmented reality, which is used 34.3% of large advertisers (and 29.6% of medium-sezed advertisers and 15.3% of small-sized advertisers). Large advertisers also stand out in the use of influencers for their brands (48.5%), in the generation of content through social media and the so-called buzz marketing, which is used by more than half of the large advertisers versus 30.7% of small advertisers. Also noteworthy tools armong large advertisers are BIDI code promotions (used by 54.5%) and branded content, used by more than half of large advertisers (compared to 25.5% of smal-sized advertisers). Another major concern of the consulted companies is the experience and education of the professionals responsible for implementing the online communication actions. Thus, participants were asked: Are advertising professionals currently prepared to carry out advertising communication strategies in the digital environment? 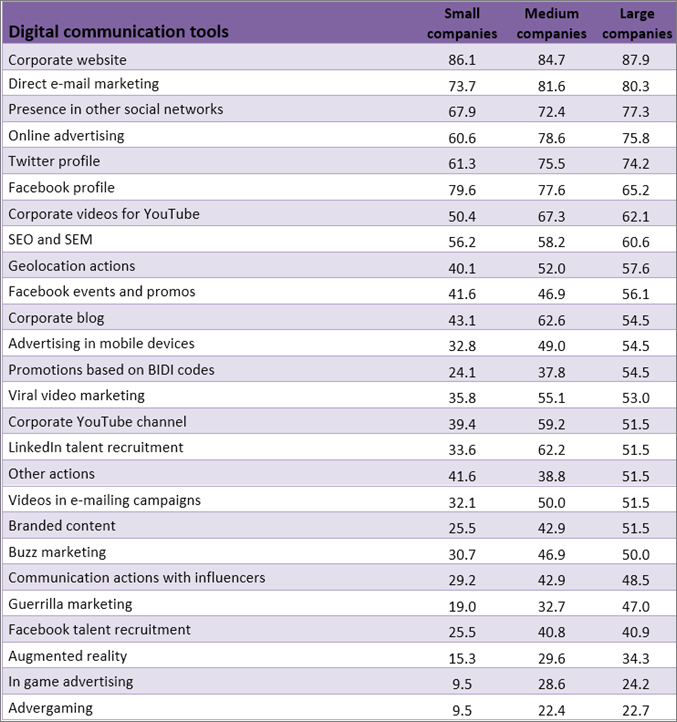 Although the search for experts in digital communication and marketing seems to be a constant fact in companies, only half of the interviewed advertisers believe that communication professionals are sufficiently trained to implement new communication techniques in the online environment (which was detected by the aforementioned Second study of digital competences in Spanish companies). This perception on the lack of qualifications in the sector is leading to the predominant use of the most conservative techniques (such as corporate website, direct marketing and presence in social networks). In this sense, the lack of experts who can understand their needs properly and offer solutions adapted to the new technologies slows down the implementation of and investment in more sophisticated techniques whose use requires specialised knowledge (for example, augmented reality). 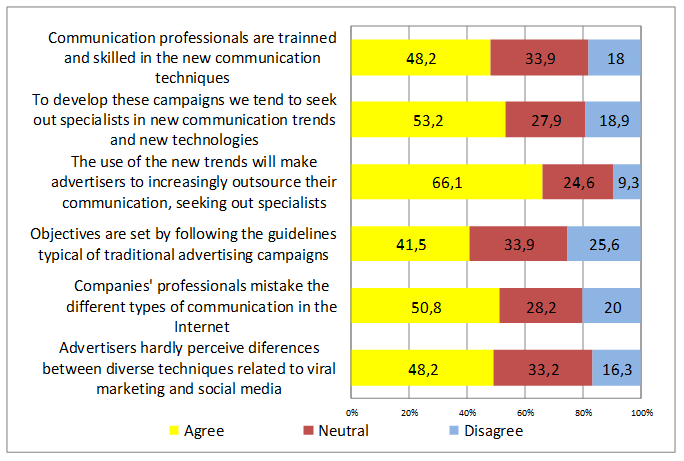 However, despite this negative perception of the education and training of advertising professionals, 53.2% of the consulted companies indicated that they usually seek specialists in new communication trends and new technologies to develop their campaigns while 66.1% say they are willing to outsource their communication strategies to agencies specialised in different areas in the search for these specific experts. This trend will change the way we work and hire communication services from companies. Long gone are the advertisers that work with only one advertising agency. In the future advertisers will work with many different agencies, specialised in different fields, in which the coordination of the marketing department will be critical to generate synergies between all of these agencies. And even as Lucius & Hanson (2016) point out, the Chief Marketing officer (CMO) will have to work with the Chief Information Officer (CIO), to ensure the marketing strategies have the technological tools necessary to interact and connect effectively with the different audiences. This is what the American Association of Advertising Agencies (AAAA) for the first time in 1989 called “Integrated Marketing Communication” (Duncan & Everett, 1993), which applied to the online environment has also been defined as: “interactive integrated marketing communication” (Peltier et al., 2003), “Integrated Web-based marketing communication” (Barker and Angelopulo, 2004), “Online Marketing Communication” (Jensen and Jepsen, 2008), “Integrated Online Marketing Communication” (Gurau, 2008) and “Interactive Marketing Communications” (Keller, 2009). That is, what Nowak and Phelps (1994) pointed out as “a single voice” in marketing communication, that is, to convey a brand image based on a unique strategy, regardless of the technique and channel used (offline or online). This perception the lack of digital competences in professionals also affects the directors of the communication and marketing departments since about half (41.5%) of the advertisers show a very conservative attitude in their communication objectives, which follow the same guidelines as in traditional advertising campaigns, which is an important professional starting point. In addition, there is confusion among professionals about the techniques developed in the online environment, which complicates their implementation. In fact, 50% of the consulted companies consider that the professionals who work with them mistake the different types of communication on the Internet (such as online advertising, email marketing, corporate website, etc.) and the same happens with the different relational techniques, viral marketing and social networks (such as branded content, inbound marketing, content marketing, etc.). Although it is true that there is some problems of confusion and education of specialists in the field of digital communication, a positive aspect to note is that 41% of the consulted companies do not plan to stop using them despite having failed in their application, nor has it negatively influenced their relationship with their agencies (45% even believe that it has improved). However, opinions are divided when asked about the influence of the lack of experience in the use of digital techniques in their future use: One third of the companies have a more conservative attitude as they do not plan to implement them out of fear to do it wrong, while another third of the companies are more willing to implement them despite not having knowledge and previous experience in that matter. Opinions are also divided among companies about the possibility of being able to change the current team for a more qualified one when there had been failures in the implementation of a digital communication strategy: about a third would change it after a negative experience and would try to find more qualified professionals, while another third would continue to trust and bet on the same team, perhaps because they do not think they can find a better one. It is interesting to note that the use of this type of online techniques has provoked a more responsible attitude and work practices among advertisers, as half of them believe that it is necessary to be more demanding when measuring results and setting objectives. In addition, 66% of the companies are looking for information about the possible approach and execution of these techniques before implementing them, and 53.5% do some sort of preliminary research. In view of the results obtained from the study, everything seems to indicate that there is much to learn and work to do. In this sense, universities will be a key element as they should train future professionals and provide them with the digital skills that companies will demand in the coming years. This section addresses the attitudes shown by the companies in relation to the trends and future investment in advertising in the digital environment. 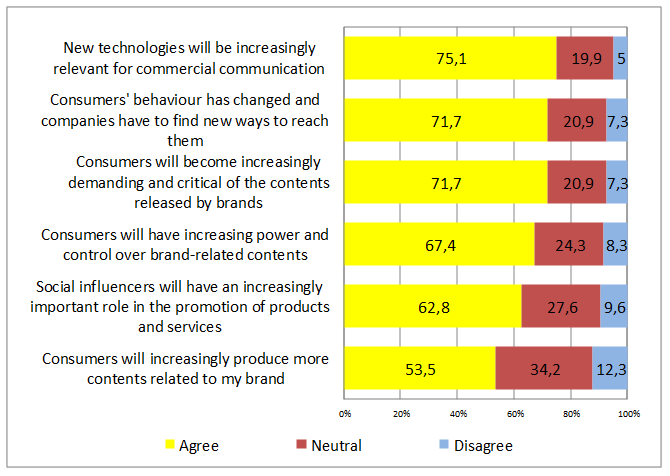 The majority trend among advertisers is that new technologies will become more and more relevant for commercial communication (75.1% of companies agree with the statement “new technologies will become more and more relevant to commercial communication”). This fact corroborates the future trend identified by other studies, not only in Spain but also in the international arena (The CMO Survey, 2016; Digital Marketing Forecasts, 2014; AMES, 2016). Another one of the great tendencies pointed out by advertisers is the change experienced in the behaviour of the consumer. They believe consumers have acquired a new role in recent years. This is forcing companies to search for new ways to communicate with them (this is affirmed by 71.7% of the consulted companies). Gil and Romero (2008) coined the term crossumer to refer to a consumer who has become more demanding and critical about commercial communication of brands (71% of the companies agree with this statement) and is increasingly harder to reach and persuade. In this sense, 67.4% of the companies believe that this new consumer has more and more power and control in the content offered by brands. This has resulted in a new very effective form of communication generated by influencers with whom a brand works to generate content and distribute it among its community of followers. Thus, 62% of the consulted companies believe that the role of social influencers (Instagram and YouTube influencers) will become more and more important in the promotion of a company’s products. The latest Nielsen Global Trust in Advertising Survey (2015) points out that consumers trust and rely more on the comments generated by other consumers than on the advertising generated by a brand. That is why this type of communication will occupy a relevant position in the coming years. However, despite the increasingly important role of the consumer in the brand’s strategy, only half of the companies surveyed agree with the idea that the consumer increasingly produce contents related to their brands, i.e., that the consumer will acquire a role of prosumer (producer + consumer). Still many companies are reluctant to leave part of the production of their brand content to consumers, who could make an incorrect use of the brand. In addition, since they are relatively new strategies their efficiency and results cannot be measured accurately, which provokes some fear and suspicion on the part of some companies. Therefore, digital communication will produce a deep change in the way companies plan and integrate their communication strategies by combining the offline and online environments. Faced with these changes in the way consumers perceive and accept the communication of companies and in the new channels and opportunities technology offers, almost 70% of the surveyed companies state that the budgets for this type of action will increase. 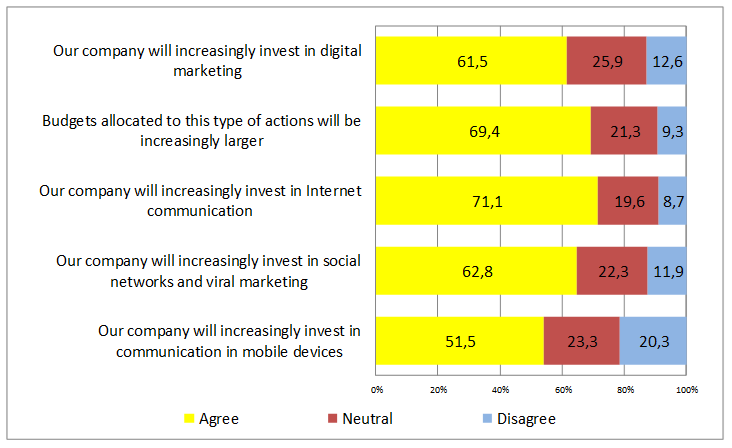 In addition, companies will invest more and more in digital marketing (61.5%). To be precise, 71.7% of the companies will bet on communication on the internet, 62.8% on social networks and viral communication, and 51.5% on mobile devices. All these changes in the context of the communication of brands with their publics have, on the one hand, made companies to increase investment in digital marketing in the next years. However, on the other hand, there is a demand for a greater professionalisation of the sector, i.e., of experts in new technologies who will have to implement companies’ communication strategies in the online channel and with different non-conventional formats. In this sense, both advertisers and agencies point to the increasing importance of education and preparation of marketing and advertising professionals to better understand and use these new communication technologies. Although this aspect still represents a gap for Spanish companies, there is a very positive attitude towards the future professionalisation and qualification of communication and marketing directors in the development of digital strategies (about 70% of the consulted companies believe that both agencies and advertisers will be more prepared and trained in the future. These data reinforce the results of the Second study of digital competences in Spanish companies (2016), according to which 65% of companies are expected to invest in digital education in a mid or strong way in the next two years. In addition, this increase in education will influence the investment made in digital projects, as 70% bet on further development and implementation in the future. It is, therefore, important to note that there is a direct relationship between investment in education and the increase in digital projects. As companies are more capable and trained in digital strategies, a greater number of projects will be carried out, much more sophisticated and with specialists ready to start implement them. There is no doubt that technology has transformed marketing in companies, and has given digital marketing actions a predominant role in the way companies reach out to consumers. As Lucius & Hanson (2016) point out, “the current success of many companies is largely due to the adoption of technology” (p. 46). That is why already many companies, either large, small of medium-sized, have incorporated digital actions in their marketing and communication strategies. As we have shown, the three main communication tools used by Spanish advertisers are the corporate website, direct marketing via e-mail, and presence in social networks. These results coincide with those obtained by Leeflang et al. (2014), who surveyed 777 marketing directors from American and European companies, which indicates that Spanish companies are currently using the same digital techniques as companies from across the world, which places us in a similar line to other countries in the use of digital marketing within companies. In addition, large-sized Spanish advertisers use more sophisticated communication techniques which allows for greater segmentation depending on the differences of their publics, while small-sized companies use a smaller variety of digital communication techniques and bet on the most common and traditional to connect their brand with the consumer. In other words, reality shows us that in general companies bet on more standard, known and easy-to-develop digital communication techniques, leaving aside those more sophisticated techniques whose implementation requires people with greater knowledge and specialised preparation. In addition, the fact that some of the new digital communication techniques require advanced technologies and a strong investment complicates their implementation at present. In this sense, if we take into consideration the first idea, we are faced with the need to tailor education programmes to the demands of companies, in order to offer innovative solutions that are better than the digital communication techniques currently used by advertisers in their communication strategies. In this direction, this study offers another interesting conclusion: only half of the advertisers participating in the study believe that today’s communication professionals are sufficiently skilled to implement these new techniques in the online environment (a percentage still very high when compared to the percentage of American employers who think so: 37%). In this sense, Lucius & Hanson (2016) point out that “marketing managers should be open to learning and acquiring new skills capable of providing multimedia experiences to their customers” (p. 47). They highlight the effective use of social media to interact with consumers who are living in an increasingly connected world. In addition, there is confusion among professionals of the sector in relation to the set of techniques developed in the online environment, which complicates even more their delimitation and use. This confusion can be the product of the very changing and constantly evolving digital environment, which intertwines the names, objectives y forms of application of each technique. This fact should make us think about whether this lack of clarification is a consequence of the lack in the curricula of degree programmes in communication of specific modules and courses on the new communication techniques developed in the online environment. However, it is interesting to note that the use of this type of online techniques has often provoked much more professional attitudes and work practices as advertisers consider that it is necessary to be more demanding when measuring results and setting objectives. In this sense, all knowledge and skills related to work processes, planning strategies and their communication and metric actions, must be reinforced in the education of future professionals. This idea was already pointed out in the study conducted by Royle & Laing (2014), who highlighted that universities and business schools need to review their education programmes and include courses related to new technologies and digital tools. In addition, these authors created a model (called “the digital marketer”) that identifies the six essential qualities that a digital marketing professional should have: competencies in new technologies; knowledge in metrics, monitoring and evaluation; strategic integration of competencies in digital marketing with traditional tools; ability to make future forecasts; skills to generate engagement with customers; and knowledge in the principles of corporate communication. The majority trend observed among the interviewed advertisers is that new technologies will become more and more relevant to commercial communication and this will generate changes in the ways in which companies plan and integrate their offline y online communication. These changes not only affect the way communication planning is carried out, but also the way consumers perceive and accept advertising in its broad sense and the opportunities and new channels that technology offers. In this sense, the study carried out by Leeflang et al. (2014) proposes that companies will face 4 major challenges in the future: investigate the “insights” of consumers and know how to manage data to compete effectively in the market; use the power of social media to create customer relations; know the new digital metrics to be able to evaluate the effectiveness of digital marketing actions and; finally, to find talent formed in the development of digital metrics. Likewise, for Stanton and Stanton (2016) and Power (2016) the evolution of the Big Data is another major challenge in the coming years, which will create the need for specialists in data analysis and the analytical measurement of digital tools. Power (2016) has called this new profile as “data scientists”, experts who explore and analyse data coming from different sources in order to get relevant information to apply in marketing strategies (which as mentioned is one of the most wanted positions today). However, companies, professional associations and organisations in the sector have stated that they will increase their investment in digital marketing in the coming years (specifically in Internet communication, social networks and viral marketing and mobile devices), and this should prompt greater professionalisation of the sector. In this sense, advertisers and agencies should be more and more trained and prepared in digital competences to understand and use these new communication technologies. That is, a more specialised and updated education to meet market demands and offer competitive professionals in such a changing market. In this regard, the current curricular need to be reviewed and study programmes need to be made more flexible, interdisciplinary and adaptable to the changes of the communication environment. As Wymbs (2011, 2016) pints out, the university needs to make a profound change in the teaching of disciplines related to marketing and communication, including subjects related to the digital age and data analysis. In this way, the curricula of degree programmes will be in line with the current and future demands of the digital environment, providing new professionals with an updated curriculum vitae and greater guarantees to compete in a competitive labour market. * Funded research: This article is a product of the R&D project titled “Research challenges” (Reference CSO2013-46410-R), funded by the Ministry of Economy and Competitiveness within the framework of the 2013-2015 National R&D Plan, oriented to the challenges of society. ANECA (2010): Libro blanco de Títulos de Grado en Comunicación. Madrid. Barker, R., & Angelopulo, G.C. (2004): “The integrated web-based marketing communication model: A South African case-study”. International Journal of Technology, Policy and Management, 4(1), 53-62. Castellblanque, M. (2006): Perfiles profesionales de publicidad y ámbitos afines: ¿qué quiero ser? ¿Qué quiero hacer? ¿Para qué́ tengo talento? Barcelona: UOC. Corredor, P. & Farfán, J. (2010): “Demandas y formación: nuevos perfiles profesionales para la publicidad en España”. Pensar la publicidad, 4(1), 97-116. Day, G.S. (2011): “Closing the marketing capabilities gap”. Journal of Marketing, 75, 183-195. Dodson, I. (2016): The art of digital marketing. New Jersey: John Wiley & Son. Duncan, T.R., & Everett, S.E. (1993): “Client perceptions of integrated marketing communications”. Journal of Advertising Research, 33(3), 30-39. Ghotbifar, F., Marjani, M. & Ramazani, A. (2017). “Identifying and assessing the factors affecting skill gap in digital marketing in communication industry companies”. Independent Journal of Management & Production, 8(1). Gil y Romero (2008): Crossumer: claves para entender al consumidor español de nueva generación. Barcelona: Gestión 2000. Grishikashvili, K., Dibb, S., & Meadows, M. (2014, April). “Investigation into big data impact on digital marketing”. In International Conference on Communication, Media, Technology and Design (pp. 146-150). Gurău, C. (2008): “Integrated online marketing communication: Implementation and management”. Journal of Marketing Communications, 12(2), 169-184. Hamill, J., Tagg, S., Stevenson, A. & Vescovi, T. (2010). “New developments in online marketing”. Journal of Marketing Management, 26(3), 181-186. Hoffman, D.L. & Novak, T.P. (2011): “Marketing communication in a digital era”. Marketing Management, 20(3), 36-43. Holm, O. (2006): “Integrated marketing communication: from tactics to strategy”. Corporate Communications: An International Journal, 11(1), 23-33. ICEMD-ESIC (2016): 2º Estudio de Competencias Digitales en la Empresa Española. International Advertising Bureau (IAB) (2017): Inversión publicitaria en medios digitales 2017. Madrid. Jensen, M.B. y Jepsen, A.L. (2008): “Online marketing communications: Need for a new typology of IMC?”. Journal of Website Promotion, 2(1), 19-35. Keller, K.L. (2009): “Building strongs brands in a modern marketing communications environment”. Journal of Marketing Communications, 15(2/3), 139-155. Kestnbaum, R.D., Kestnbaum, K.T. & Ames, P.W. (1998): “Building a longitudinal contact strategy”. Journal of Interactive Marketing, 12(1). 56–62. Leeflang, P.; Verhoef, P.C. ; Dahlström, P. & Freundt, T. (2014): “Challenges and solutions for marketing in a digital era”. European Management Journal, 32(1), 1-12. Lucius, H. W., & Hanson, J. H. (2016). “Consumerism and Marketing in the Digital Age”. American Journal of Management, 16(3), 41. Nielsen (2015): Nielsen Global Trust in Advertising Survey. Nowak, G. & Phelps, J. (1994): “Conceptualizing the integrated marketing communications’ phenomenon: an examination of its impact on advertising practices and its implications for advertising research”. Journal of Current Issues and Research in Advertising, 16(1), 49-66. Nuñez, P., García, A. & Abuín, N. (2013): “Profesionales digitales en publicidad y comunicación. Una aproximación a las necesidades del mercado laboral”. CIC Cuadernos de Información y Comunicación, 18, 177-187. Papí-Gálvez, N. & López-Berna, S. (2011): “Medios online y publicidad. Perfiles profesionales en educación superior”. Vivat Academia, 117, 672-700. Peltier, J., Schibrowsky, J. & Schultz, D.E. (2003): “Interactive integrated marketing communication: Combining the power of IMC, the new media and database marketing”. International Journal of Advertising, 22(1), 93-115. Power, D. J. (2016). “Data science: supporting decision-making”. Journal of Decision systems, 25(4), 345-356. Preston, C. (2000): “The problema with micro-marketing”. Journal of Advertising Research, 40(4), 55–70. Royle, J. & Laing, A. (2014): “The digital marketing skills gap: developing a digital marketer model for the communication industries”. International Journal of Information Management, 34(2), 65-73. Seric, M. & Gil Saura, I. (2012): “La investigación en torno a la comunicación integrada de marketing: una revisión”. Cuadernos de Administración, 25(44), 63-92. Stanton, A. D. A. & Stanton, W. W. (2016). “The relationship between Big Data, data science, digital analytics and the skills and abilities needed to optimise marketing decisions”. Applied Marketing Analytics, 2(3), 265-279. Tiago, M. T. P. M. B. & Veríssimo, J. M. C. (2014). “Digital marketing and social media: Why bother?”. Business Horizons, 57(6), 703-708. Wymbs, C. (2011). “Digital marketing: The time for a new “academic major” has arrived”. Journal of Marketing Education, 33(1), 93-106. Wymbs, C. (2016). “Managing the Innovation Process: Infusing Data Analytics into the Undergraduate Business Curriculum (Lessons Learned and Next Steps)”. Journal of Information Systems Education, 27(1). Article received on 12 September 2017. Accepted on 20 December.